Sheilacakes: Bisquick Pancake Breakfast Review and LIVE Giveaway. Bisquick Pancake Breakfast Review and LIVE Giveaway. Nothing says breakfast like a hot stack of pancakes. Our favorite brand of pancake mix is Bisquick. That was the brand my mom used when I was growing up and the brand my grandma used, so naturally now as an adult I use Bisquick to make my son pancakes. We like them plain, but we have also have been known to throw in some chocolate chips or berries in the batter. Pancakes are little clouds of goodness. Noah loves all kinds of breakfast foods. He lovingly calls pancakes, cancakes. Bisquick Pancake Nation is a national effort to inspire pancake lovers to unite through pancake breakfasts. Join the Bisquick Pancake Nation to find everything you need to know about planning and hosting a pancake breakfast fundraiser. From now through May 31st, you can apply for a $250.00 grant* for your qualified non-profit organization so that you can host your own pancake breakfast fundraiser in your local community. We really enjoyed our pancake breakfast and using our new cast iron griddle pan, Cast Iron skillets make me think of my grandma because she always cooked with one. It has now been passed on to my aunt Peggy. When we go and visit them in California my aunt Peggy will sometimes use her cast iron skillet along with her dishes and we will remember my grandma Rose. The great thing about cast iron is it lasts for forever. We enjoyed the hot delicious pancakes too. Who doesn’t love pancakes? It is in my opinion the traditional American breakfast. They are so easy to make with Bisquick. Not sure when they are ready to be flipped? Just look for the bubbles and when they pop you are good to flip them. I really like the mixing bowl with the spout too. I am notorious for spilling things in the kitchen. Every time I am spooning something out I always get some on the counter. I didn’t with the mixing bowl. You must do the mandatory entry, after that you can comment as much as you want. Be Sure you leave a way to contact you. Since I am a member of MyBlogSpark I had the opportunity to share this with you. 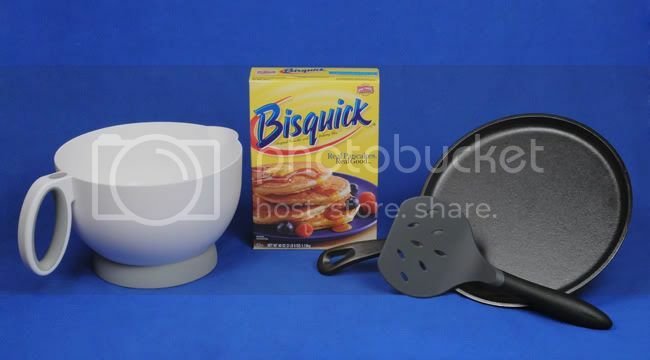 The product, prize pack, and giveaway have been provided by Bisquick through MyBlogSpark. These opinions are my own. We love pancakes, especially my toddlers. They gobble them up and like dipping pieces in syrup. I remember as a child when I was sick with a cold and home from school, my grandmother made a big homemade stack of them for me and that made me feel better. They are just so comforting like that don't you think? I would love to win this. We really need a cast iron skillet. I love pancakes, but even as a mother of 3 and 27 years old, I STILL can NOT make them properly. I grew up with my dad making amazing pancakes and now, my husband's are even better! I cant believe there are only 2 of us here for this! I LOVE breakfast! I love them too but mine never come out perfect. Me too! I haven't eaten yet either. Neither have I. I have to force myself to eat breakfast at the right time, especially after coffee. *sigh* someone tell me why the whole school district gets a 2 hr early dismissal because of the HS prom tonight? My favorite kind of pancakes are chocolate chip & banana! Tawnda - For the same reason here in Vegas, if you live in a "low income area" your kids get free all day kindergarten, but other areas, such as ours, have to pay $300/month to go all day. Im having oatmeal with berries for breakfast today! I have such a busy day! I have to go to a meeting soon. Its not too busy of a day for me here. Im glad its Friday, & this weekend is VERY full, but tonight is just a LONG gym workout. I could eat a pancake now... Mmm. Have a wonderful day... I'll be back in a bit! I think I could always eat a pancake or two, at any given moment. My children love pancakes, especially the little silver dollar sized ones. My son likes to put red food coloring in his. I don't know why. I want the skillet and the goodies. Getting my girls ready for school dropoff & still fantasizing about breakfast & pancakes! Im here on & off and will continue to be until this is over. How's everyone's day going? It's going slow... maybe if we all tweeted? I will now. Apparently tweeting didn't help either... lol oh, well! I tried. Made pancakes as recently as this weekend -- have to make them egg-free for DS as he's allergic. They really ought to try including some allergy-friendly alternatives on the box, like how to make them without eggs or milk. The lack of knowledge is part of why we CAN'T go to pancake breakfasts because DS won't have anything to eat! Surprised there aren't more comments here, but I'll do my best to get it moving! Speaking of my aforementioned "allergy-friendly" recipes -- FYI: You can swap the milk for any liquid. I even made OJ pancakes when my daughter was having trouble with dairy as an infant (I was nursing). For the eggs, if you follow the "light and fluffy" recipe on the box and just omit the eggs, they're still pretty darn good! I normally replace the two eggs with two tablespoons of ground flaxseed and six tablespoons of water (or just more milk). It's amazing how goopy the flaxseed and water gets! I LOVE cast iron! 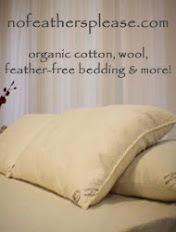 If you take care of it properly, you can hand it down to your grandkids & beyond! My mom made pancakes for us kids a lot when I was growing up. She'd pour the batter out and make hearts and elephants and Mickey Mouse faces! I still haven't gotten around to making the fun shapes for the kids -- I have no artistic skills like that! I cant even make pancakes properly, let alone cute shapes. I know, mommy fail right? I just bought a box of Bisquick yesterday. I also bought two pints of fresh blueberries. Wouldn't they make wonderful pancakes?! I love blueberry pancakes too! Im on my way! Im from Vegas, where is everyone else from? I think pancakes sound like a good breakfast for tomorrow. Hope hubby's up to it! lol I can't make them either; never could! I'm from a rural western NY town. Everyone always thinks NY city when I say NY, and I have to laugh; we have way more cows than people. Im taking you up on that offer!! AH yes, Im down to receive some pancakes! Is the airfare to SD included in that invite??? Those of you who do pancake shapes -- Do you draw "freehand" or do you use "pancake molds". If you use molds, any recommendations? It's a good thing I just had lunch or this would be making me hungry! I have tried our cookie cutters for shaping eggs. It was a no go. I need to get a lot done this weekend. Hope the motivation kicks in soon! I have gotten several things done today though - put the laundry away, cleaned the kitchen and organized my coupons. It's a start! The coupons were getting a bit out of control - hadn't organized them for 3 weeks or so...I know better than to wait that long! It's choc chip pancakes here enough that I think my kids wouldn't recognize a pancake without them! I hear ya on the tidying up the house -- Finally did some cleaning and laundry here the last 24 hours too. Looks like things are finally moving here comment-wise! but I'm sure she would love them so much! That's it, we are having them for breakfast tomorrow. I still need to exercise today too. I clean on Saturdays but Im OCD so it gets done often. I have the wii fit, but lost 55lbs at home & need the gym for the last 20! We have a cast iron dutch oven & I love it! dragged the kids to the gym this morning -- love them babysitters! My daughter is carrying around her 'baby' - it's just so cute. @Marcie - congrats on the weight loss, that's awesome. but at least the wii makes it a bit more fun! I love choc chip pancakes! YUM. I'd like one of those shape thingy's. Working & having to lose would be very difficult. I remember a time when I went to the Pancake House with a group of coworkers for lunch. It was sinfully rich eating chocolate chip pancakes at noon. but she was worth it of course. Although, there's always room for pancakes!! But also in '97 I was working the graveyard shift, so I was off work by noon - and with no baby, it was easy to work out 6 days a week! I work with a girl that had twins in august of '08 - she just ran a 1/2 marathon last weekend...I am a bit jealous!! She makes time to run at least 4 times a week, works, and has twins. Whew! impressive, no? It was so much easier to lose weight when I was younger. It just gets harder and harder! Someday, that will happen. someday. I've only finally gotten to be good about going to the gym early last year. Just wish they had babysitting hours after lunch while DS is at half-day kindergarten. Haven't lost any weight unfortunately -- my thyroid's starting to fizzle out (darn genetics -- mom and sis's went hypo too). If it doesn't, we'll go for a walk later. I am off work today, so it's a good day to get things done, and fit in a walk, too! Well, its time for me to go pickup my Kindergartener, so, there goes my chance. GL everyone! I have chicken thawed...how should I fix it tonight? I read a really good marinade recipe this morning...I guess I better get it marinating soon if I am going to do that! I love chicken; anyway you make it! My ABSOLUTE favorites are chicken scampi and souvlaki! grilling chicken right now -- on skewers... marinated just in Italian dressing. I have some spaghetti squash in the fridge, that sounds yummy. I love quinoa, too, but am almost out. need to go to the co-op and get some more. Have to start separating my sentences out to try and fill up these comments before dinner. Running out of time! So it's either spaghetti squash, broccoli, or cauliflower tonight. It's quite funny because she says ewwww the whole time, as she is laughing! we are planting a huge garden soon - it's going to be too big. oh! I got new moon in the mail from netflix today! I can't wait to watch it! pouring drinks.... need this contest to be done ASAP! I read julie & julia, then watched the movie in 15 minute increments over the last week. but meryl and amy did SUCH a good job. awesome acting!! i read all 4 twilight books from january to march. They were so good. I didn't think I would like them, but I really did. They are turning 2 next week! so she had 3 boys under 18 months! son is throwing tantrum about dinner... ugh!